From this transaction, Sterling made contributions in the amount of $42,500 to local charities, including Monroeville Education Foundation, Monroeville Area YMCA, HIPPY, Pilots for Christ, Camille Place, and Kings Kids Foundation, LLC. Many applications have been received from Monroeville residents who have previously been required to drive two to four hours to have full time employment at a liveable wage. This will greatly improve the quality of life for employees and their families. With more than 25 years in the industry, Sterling Packaging, Inc. serves customers ranging from small, privately owned businesses to Fortune 500 companies. Industries they serve include food, beverage, consumer goods, hardware and industrial parts, pharmaceutical-beauty, and confectionery. Sterling Packaging, Inc. is most notably known as the packaging supplier for craft beer. The company has been supporting that industry for more than 15 years. The New Market Tax Credit (NMTC) allocation of $8.5 million will assist the company in the reuse of a vacant site building and new equipment purchases that will increase the use of recycled paper and reduce paper waste as compared to their current operations. The project will entail a 60,000-square foot facility that will include 55,000-square foot of manufacturing and industrial space and 5,000-square foot of office space. 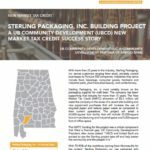 With 75-90% of the workforce coming from Monroeville for the project, Sterling Packaging Inc. has partnered with Alabama Industrial Development Training for recruiting, screening, training, and leadership development. Many of the applicants are Monroeville residents who have previously been required to drive two to fours hours to have full time employment at a livable wage. This project will create 84 new full-time jobs for these individuals and heavily impact the quality for employees and their families. 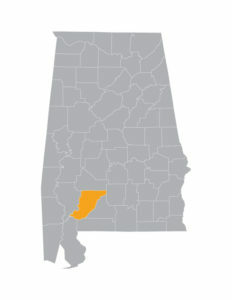 UB Community Development’s strong history as an experienced leverage lender in New Market Tax Credit transactions, coupled with our passion for improving the communities we serve, have earned UBCD the reputation as Alabama’s premier financial partner for rural economic and community development.